the boro rice crop in three low-lying northeastern districts of Bangladesh has been hit hard due to erratic weather conditions, which has necessitated change in sowing pattern. The crop, grown between November and May every year, stands damaged over 53,000 hectares (ha) in the single-crop areas of Netrakona, Brahmanbaria and Kishoreganj districts. Harvests in recent weeks showed that farmers did not get even 10 per cent of the normal yield. Scientists hold two factors responsible early preparation of seedlings and plantation of paddy due to early drying up of the fields and a prolonged cold spell affecting the reproductive capacity. Bangladesh Meteorological Department's (bmd's) statistics show that rainfall was 24 per cent below average in June, 19 per cent less in July and 32 per cent below normal in August.The flow of water from upper catchments of rivers was also less than normal, which led to water from low-lying districts receding in October itself--a month before schedule. Boro farmers then made seedbeds in October and planted the paddy in November, a month ahead of the regular planting season, says B M Mustafi, director (fields) of the Department of Agricultural Extension. The cold spell that followed affected the reproductive stage of boro because it was planted earlier than usual. A series of western disturbances maintained the temperature below 18c for long, says Samarendra Karmakar, director, bmd. "People had to use a quilt until March. Normally, warm winds begin by end of February," says weather forecaster Sujit Kumar Debsharma. Destruction of paddy can be attributed to changing weather conditions, says Nur-e-Elahi, director general, Bangladesh Rice Research Institute. Farmers shared the same view, he adds. The boro season assumes importance because Bangladesh produces the maximum quantity of rice during the season. In 2005, boro rice production was about 14.2 million tonnes as against 1.75 million tonnes of aus rice (produced between March and July) and 10.3 million tonnes of aman rice (produced between July and November). 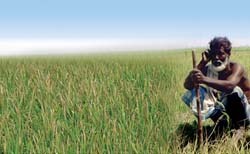 Boro rice production expanded over the years as the November to May season is flood-free, and there is less damage due to natural disasters. Irrigation facilities have also been improved. Agriculture experts, however, say that damage to boro rice crops in three low-lying districts might not affect the overall national yield because they expect bumper production on about 4.5 million ha where seedlings were transplanted at the appropriate time in mid-December after laying seedbeds in mid-November. The loss expected is about 1.2 per cent. But for the farmers of the affected districts, the loss is huge because they cannot grow another crop now on these lands. The affected farmers need support not only to overcome the present loss but also for fresh seed and other inputs to cultivate boro paddy next year, says Mustafi.